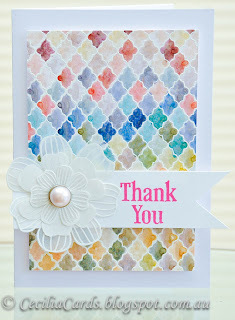 I'm so inspired by so many pretty cards posted over the last few weeks. One challenge caught my attention - CAS-ual Fridays' Black challenge. I've never tried making a black card before! I based my card on another Hero Arts idol - Shari Carroll. She posted a card a few months ago and I pinned it on my Pinterest Board. Her card is the inspiration for mine. 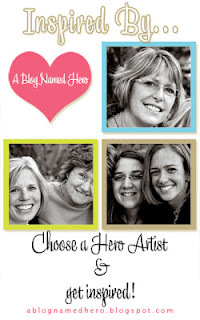 The ever so inspiring Shari is on the top right of the bottom photo. I had the pleasure in participating in the Hero Arts Flickr Group 90 minute scramble on the weekend. I've missed the last two as I have been away. 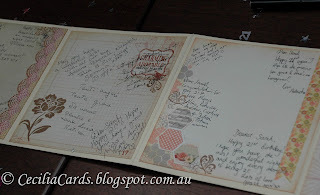 The challenge was to make a card with 'Filler stamps' (the ones that we usually don't use), add stitching (faux OK) and handwrite the sentiment. I had to read the instruction more than once before it clicked. 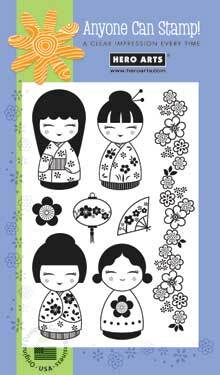 I first got out all my HA stamps and picked one with the Four Dolls (there are lantern, fan and flower filler stamps) and wanted to hang the pretty lanterns with twine. 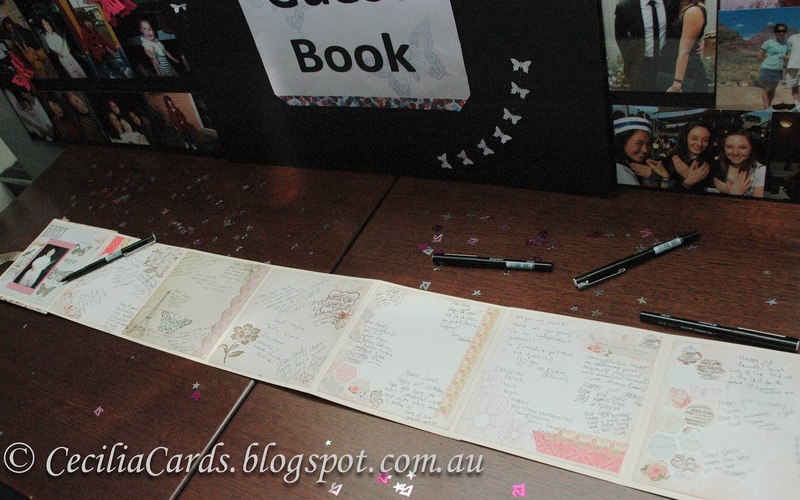 The lanterns were stamped onto the cardstock as well as patterned paper and cut out. I made a flower with die cut scalloped circles from 2 patterned papers and edged them with distress ink and scrunched them up before assembling the flower. 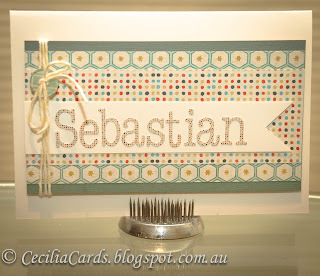 The sentiment and faux stitching was done with a white gel pen. This can be either a Birthday or Anniversary card. I had the whole card completed in 60 minutes! 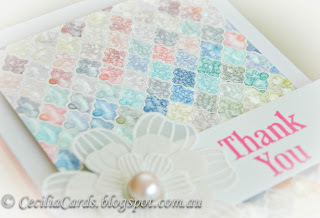 Thank you to everyone for the lovely comments on Flickr when this card was uploaded yesterday. This card has been submitted to HA July Flower challenge and Moxie Fab World Birthday challenge. 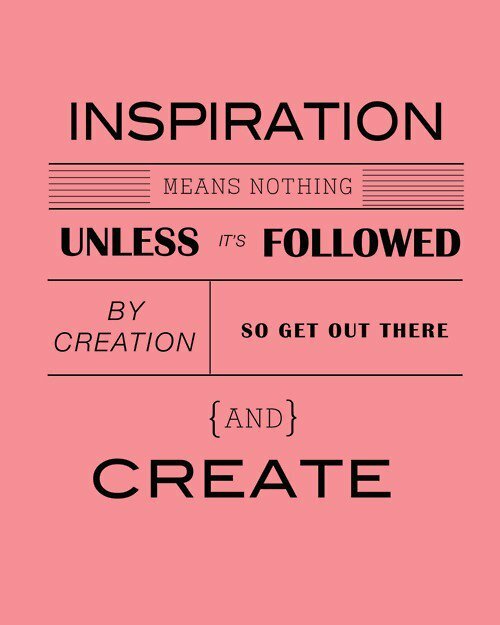 My previous post had over 400 visits in one day, thanks to Jennifer McGuire's re-tweet! 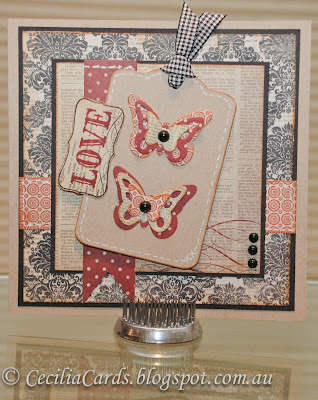 It was also picked as a CAS Favourite in Splitcoast Stampers with over 270 views and favourited 7 times in one day! Thanks for the support! It really made my day yesterday!! 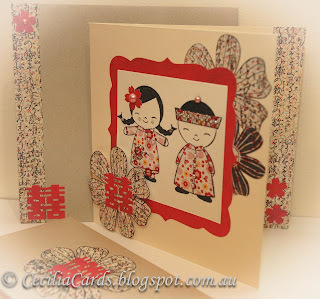 This is the Hero Arts stamp set - I've used the dolls and the border stamps but have never touched the 'Filler' stamps, until now!! 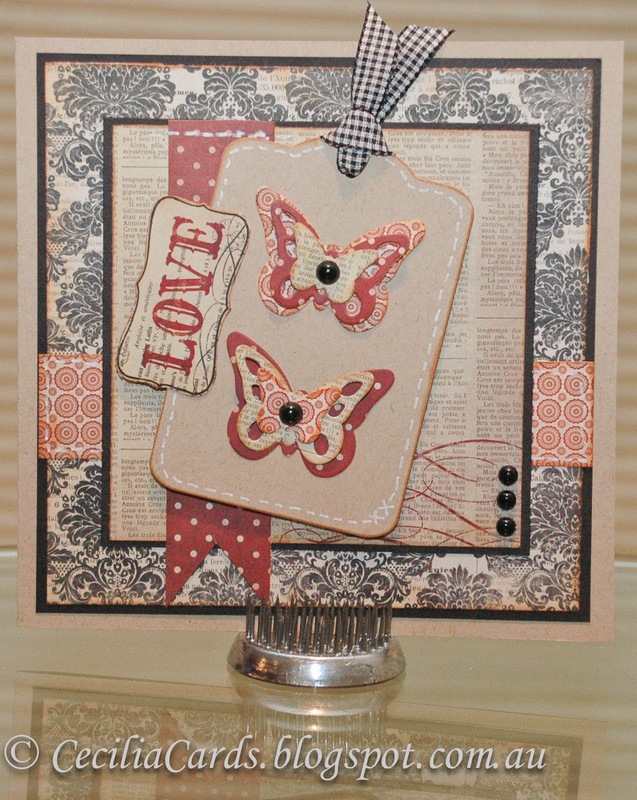 I'm getting itchy fingers as I have not crafted for a while and I have so many new stamps, inks and dies to try out. I have been dying to try out my new Tim Holtz Distress Markers. The current challenge at A Blog Named Hero is to make a card inspired by a Hero Arts Artist. One of my inspirations is Jennifer McGuire and she tested these markers before most of us could even get our hands on it! 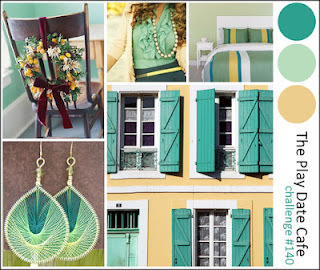 This is my card using all the colours in the pack (excluding black and white) inspired by Jennifer's card. 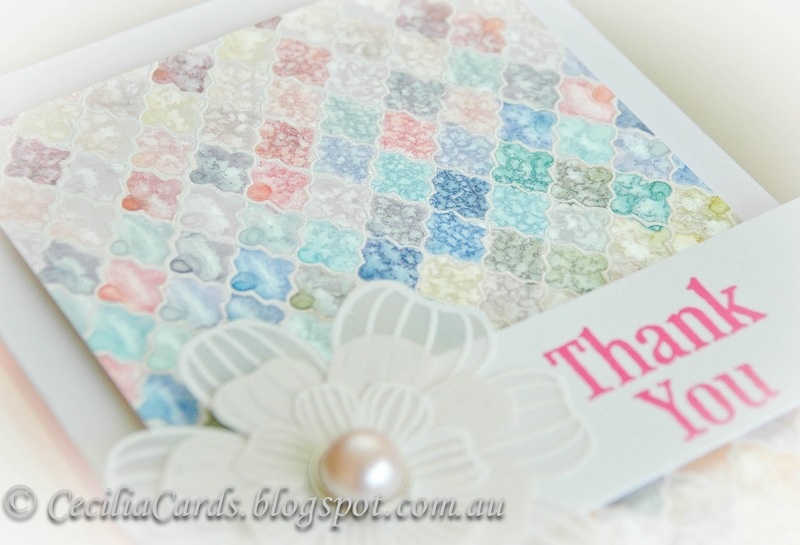 The card was white embossed with the HA/Studio Calico lattice stamp and coloured with Distress markers. 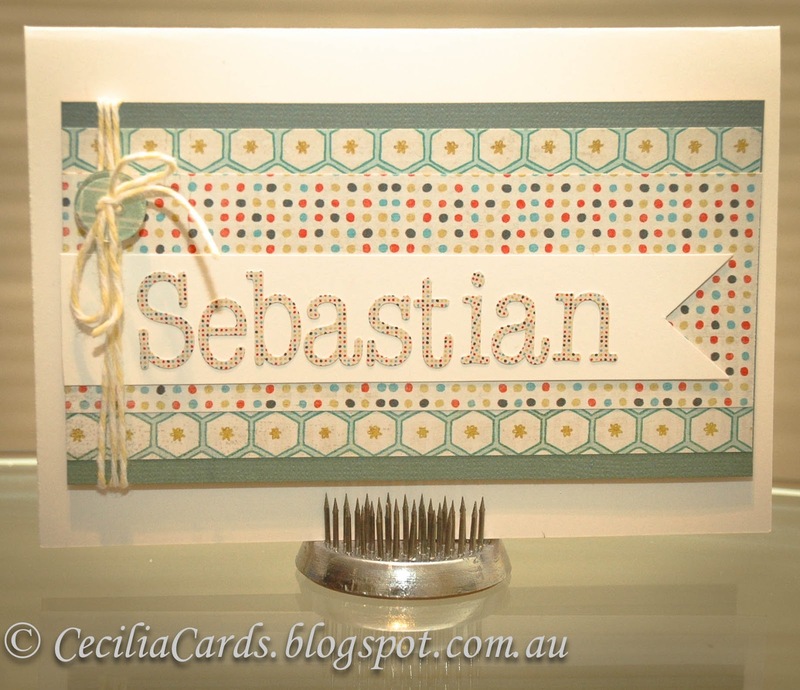 The card was sprayed with Perfert pearls mist. I love the marbled effects when the inks reacted with the water. 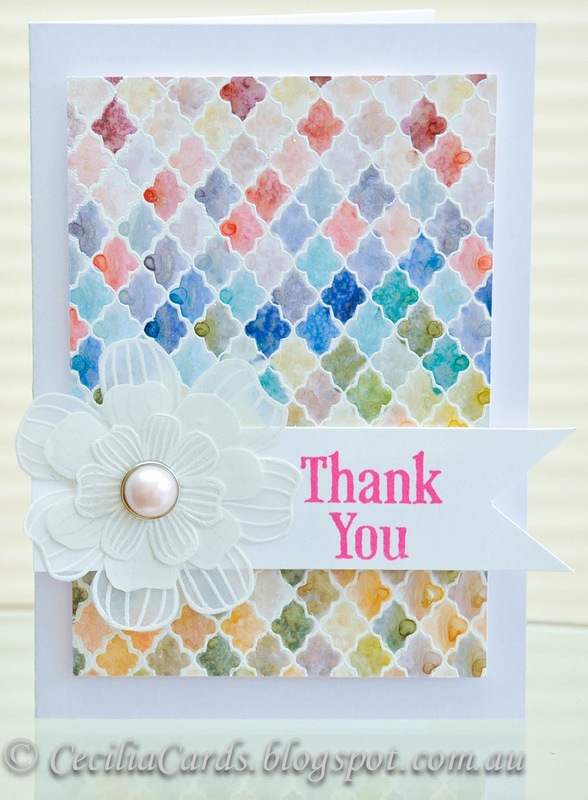 The beauty about the lattice stamp is that each colour is contained within each pattern, so there is no bleeding. 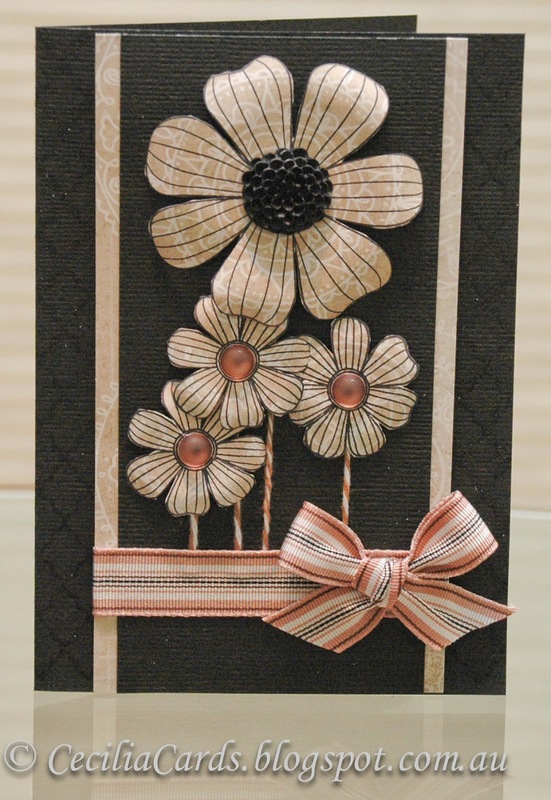 I added white embossed vellum flowers to the card so that I can submit this card for the Hero Arts Paper Flowers Challenge. 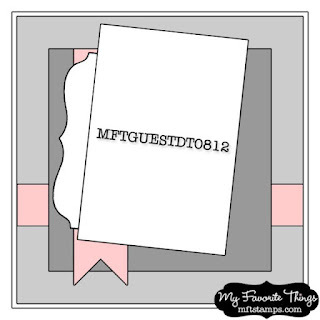 I'm also submitting this card to the Moxie Fab World Card Challenge! The lovely Jennifer is in the photo below (bottom right). Before I leave - a little message from Graphic 45 posted on Facebook.... very appropriate for this posting!! Thanks for dropping by! I finally found some time since getting back from overseas to whip up a quick card. 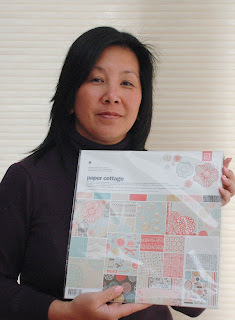 I've been dying to play with my Basic Grey Scraplift prize - the new Paper Cottage collection. 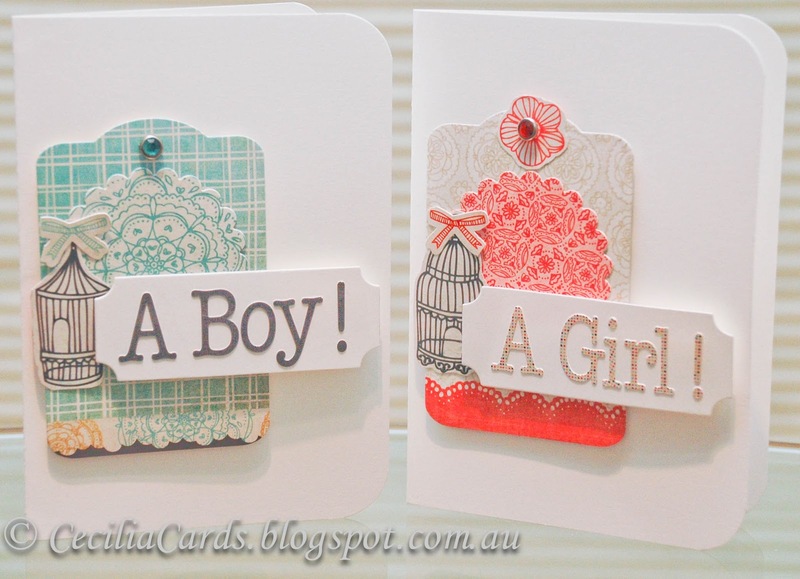 I had a baby card to make for a couple who just had their first baby last weekend. I chose some pretty papers from the collection and made a card with no stamping and used the stickers in the collection for the name. It was a fun and quick card to make. I'm submitting this card for the current Play Date Cafe colour and CAS-ual Friday's Strip challenges. It feels so good to get back into it again, I really missed my craft room! 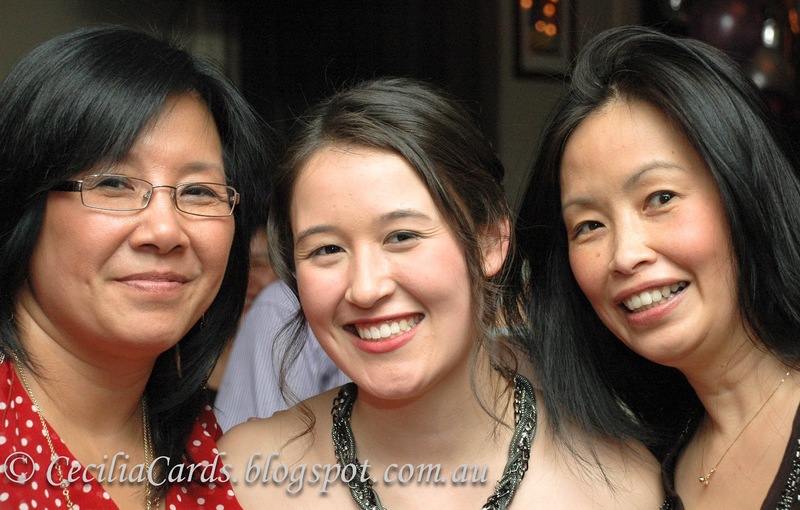 A photo of my sister and I with Sarah taken at the party. It is very rare that a photo of me gets taken as I am always the unofficial photographers at most functions! We just came back from another wedding in Malaysia after a week long holiday at Paradise Koh Yao resort on an island off Phuket. I made this wedding card and 'Red Packet' with a Japanese and Chinese theme as the groom is half Japanese and half Chinese. I used the Hero Arts dolls and dressed them up in Basic Grey Serendipity. The flowers were overstamped with a Japanese script. This pattern was repeated in the Hero Arts Big Flowers and in the strips on the inside of the card and on the envelope. A red double happiness and Sakura flowers finished off the stamp nicely. 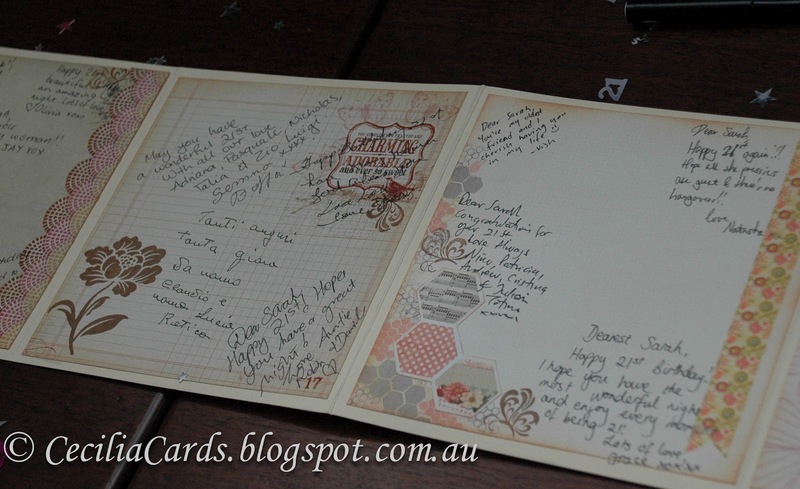 Details of the card are below and photos from the wedding and our trip after that. For details of how to make the 'Red Packet' - see my previous blog. This was the second wedding reception as Makoto and Melissa live in Singapore and the first reception was the week before. We are friends of the groom's family and their hometown is in Muar, Malaysia, halfway between Singapore and Kuala Lumpur. We were asked to participate in the traditional tea ceremony, held before the reception. Melissa wore a beautiful traditional Chinese wedding outfit during the ceremony. Afterwards, she got changed into a traditional white wedding dress. This is my second trip to Muar, we only stayed for a day during our last visit two years ago. I got to see more of the city this trip and I loved walking around taking photos of all the old shop houses and signboards. Hope you enjoy some scenes from Muar. Sorry for the long blog, but I just had to share some of the lovely photos I took. A happy parcel awaited my return on the weekend. 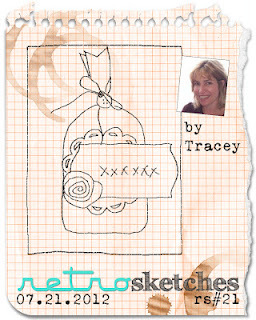 My winning prize from the Basic Grey Scraplift Challenge, result blogged on Basic Grey! 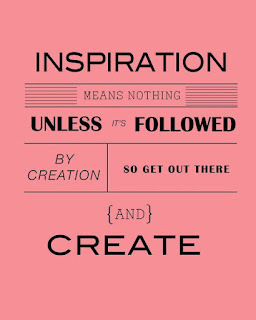 I cannot wait to start crafting again!! Thanks Melanie for the great prize! !